When cooking authentic Asian food it is ideal to include the authentic ingredients, of course. But with so many different names for the vegetables (many created through translation and appearance), and the various types of Asian greens available, it can be confusing at times to find exactly what you need. Chinese cabbage, for example, comes in two varieties, neither of which are often labeled "Chinese cabbage." Chinese cabbage's scientific name is Brassica rapa, with the subspecies being pekinensis and chinensis. While several types of Chinese cabbage exist, the variety we most commonly associate with Chinese cabbage is Napa cabbage (pekinensis), though Chinese cuisine also often includes bok choy, from the chinensis group. 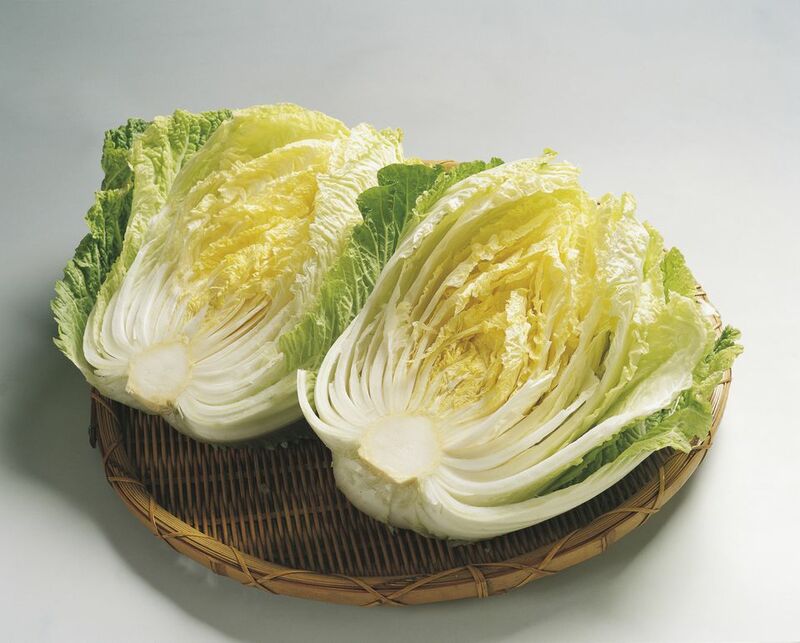 As with many aspects of Chinese culture, Chinese cabbage has a very long history. Originating in the Yangtze River Delta, it became more widespread after a naturalist from the Ming Dynasty began to share it for its medicinal properties. The vegetable traveled to the North and soon that region began to produce more cabbage than the South. The Chinese version of sauerkraut, called suan cai, made Chinese cabbage a staple in Northeastern Chinese cuisine. (This dish developed into Korea's kimchi.) Because of the vegetable's resistance to cold, the cabbage has become popular throughout the world, especially in the northern regions of the globe. The more common of the two groups, this cabbage is most often referred to as Napa cabbage, but you may also see it labeled as Chinese white cabbage, Peking cabbage, or celery cabbage. This oblong shaped, large-headed cabbage has firmly packed, crinkly, pale green, thickly veined leaves and a white stalk (hence the alternative name). More healthful than western cabbages, Napa cabbage is rich in vitamin C and other nutrients. It is mild tasting and absorbs the flavors of the foods around it, and its thin and crisp texture makes it appealing to eat raw in salads; Napa cabbage softens when it is cooked and is frequently added to stir-fries and soups in the last stages of cooking. When selecting Napa cabbage, look for firm green leaves that are not wilted or look like they have been eaten by bugs. Store the cabbage in a plastic bag in the crisper section of the refrigerator for up to three days. If you notice any spots have developed on the leaves, it means the cabbage has gone bad and turned bitter and should not be eaten. Although most often labeled as bok choy, this type of Chinese cabbage is also known as bok choi, pok choy, white mustard cabbage, and—to add confusion—Chinese white cabbage. Instead of forming a cabbage head, bok choy develops a cluster of leaves that are smooth and dark green, creating a structure similar to celery. This type of Chinese cabbage is prevalent in Southeast Asia and southern China, but because of its cold-weather hardiness, bok choy has become popular in Northern Europe as well. It has a mild flavor and is used in soups, stir-fries, braises, and stews, taking on the flavors it is cooked with. Bok choy is commonly found in supermarkets, and you will see both smaller "baby bok choy" as well as the mature larger variety. Baby bok choy is light green in color, distinguishing itself from the mature bok choy's dark green leaves growing from the white stems. Bok choy is nutritious with high concentrations of vitamins A and C. This cabbage should be packaged in an air-tight container and stored in the refrigerator where it will stay fresh for three to four days. Napa cabbage and bok choy are both eaten raw in salads and can be cooked similarly. Napa cabbage has a high water content and thus, when cooked, takes on a sweet and juicy taste. It is often featured in Chinese noodle dishes, spring rolls, potstickers, and pork buns, as well as stir-fries, such as a spicy stir-fried Chinese cabbage dish. Chinese pork dumplings include Napa cabbage in the filling, and it is the star vegetable in beef lo mein. In addition to incorporating into traditional Chinese recipes, you can also use Napa cabbage to line a bamboo steamer to help prevent food from sticking to the bottom when cooking. Before cooking with bok choy, you need to remove any dirt from inside the leaves. To clean, quarter the baby bok choy or chop mature bok choy and place in a bowl of cold water; move the leaves around a bit to release the dirt and then transfer to a bowl lined with paper towel. There are many traditional Chinese recipes featuring bok choy, such as Chinese vegetarian potstickers, Lion's head meatballs, and shrimp stir-fry with Chinese greens. Bok choy is often part of udon and ramen soups as well.